apaiser’s beautifully hand finished stone bathware, designed with superior performance in mind, is manufactured using reclaimed sustainable ingredients (crushed recycled marble) and has the highest level of stone content in the market. 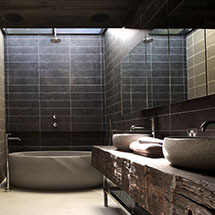 The unique manufacturing process allows apaiser to create sublime and fluid shapes in almost any form, with uniformity of colour, strength and integrity unachievable in natural stone, allowing you to create eco-sensitive bathrooms with confidence, providing timeless elegance and value to any project. View the Apaiser catalogue here.